After her father doesn’t come home one night, Carol (June Kenney) and her boyfriend, Mike (Eugene Persson) decide to go looking for him. They find his smashed up truck and a nearby cave. Inside the cave is not only a couple of skeletons, but a huge tarantula. The teens run for their lives and bring back the local sheriff (Gene Roth) and a science teacher (Ed Kemmer). The sheriff sprays gallons of DDT into the cave and drags out the seemingly dead spider. He deposits it in a local high school gym for safe keeping, but of course it may not be as dead as he thinks it is. Earth vs. the Spider is a bit of misnomer, but to call a movie, "A Couple of Teenagers and Some Cops vs. the Spider," probably wouldn’t have fit on the marquee. 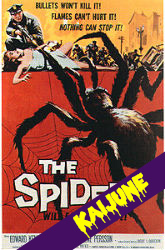 What makes me prefer Earth vs. the Spider over Tarantula (1955), despite the latter being more technically proficient and better funded in every conceivable way, is that Spider throws its menace up against up against relatively powerless people. Many giant monster films are prone to have their beasts fight armies in an effort to show the creature's power. It’s nice to have a change-up and feature protagonists who don’t have vast resources at their command, but still must figure out some way to stop a seemingly unstoppable beast. The other key moment that makes Earth vs. the Spider notable is the sequence where the authorities have brought back the seemingly dead spider into town and stowed it in a high school gym, a local band breaks into to practice some songs. A party more less breaks out and soon the spider awakens again to terrorize everyone. Once again we’re seeing an intersection of rock and roll and horror, something that will be done even more overtly in The Crawling Hand (1963). I don’t want to build Earth vs. the Spider up to be more than what it was intended to be: a budget-minded way to get kids in the theater seats and fill out a double bill. The composite shots of the spider interacting with its environment are rarely convincing. The giant prop leg that occasionally smacks people around is more comical than menacing. The acting is at best a little wooden. Although a few of the cave scenes are evocative and carry some threat, much of the film is shot in a manner that is very flat and uninteresting. It lacks any of the eeriness of it spiritual twin, The Giant Gila Monster (1959), and even fails to evoke much in the way of concern or sympathy when the spider is bearing down on a widow and her baby. At a brisk 77 minutes, Earth vs. the Spider manages to keep these flaws moving past the screen so quickly, that it becomes possible to, if not outright ignore them, at least not let them overwhelm the experience. Earth vs. the Spider is a deeply flawed, but still fun, low budget exercise in traditional 50s giant monster horror.